Here are some pics of what happens when you don’t take care of your air filter and let your oil level get to low. This is on a Arctic Cat Prowler 700 side by side UTV. 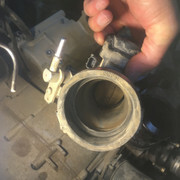 The ring end gap is about 3/16” from dirt that you can see in the throttle body and the cam chain is the first part in a engine that seizes up followed by the small end of the con rod rod when oil level is way to low. Probably a $2500 fix before I’m done and simple maintenance would have eliminated all of this. I see this kind of carnage way to often, please maintain your Vehicles and save yourself a bunch of Molla!! Thanks for the reminder! That thing is a mess. I was pretty pissed off when I wrote the post, what a waste of money. It’s not even that great a job for a tech, lots of work to remove the engine and awkward to work on. 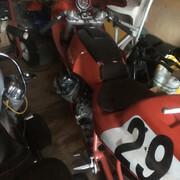 Oh well , i would rather be working on making my Franken Guzzi Lemans street legal again. I was a little miserable so I took a couple of pics, felt sorry for myself but gotta do the jobs to pay for the fun stuff. Can’t wait to ride it again!! For you it's job security. Can't imagine any of us needing to be told to watch our motor oil level. Your right about that, of the three Guzzi’s I’ve had none has used oil. But this UTV was owned by a 60 plus old guy and with it smoking so bad you would think that your oil level should be kept track of. Your right about that, of the three Guzzi�s I�ve had none has used oil. But this UTV was owned by a 60 plus old guy and with it smoking so bad you would think that your oil level should be kept track of. From what I can tell, most of the ATVs and UTVs that I see, at least the ones around here, are just throwaways meant to be rode hard and put away wet until they die, and then scrapped. This IS a sad story by the OP, but has probably existed as long as internal-combustion engines. I would feel like giving the owner a real talkin'-to, but I guess if people like this didn't exist, service revenue for people making a living fixing them wouldn't exist, either. What always amazes me is being wealthy enough to be able to drop big $$ on a toy, and then NOT being concerned about how to keep it running. I remember a guy I knew briefly when I was younger, he had a Monte Carlo that had not had it's oil changed in 15,000+ miles. This was back when it was carbureted and got maybe 15 mpg on a good day. We told him continually to just GET THE OIL CHANGED, but he'd respond with "It, uh,.......lubricates". From my end as a tech I get to see a lot of lack of maintenance problems, I never thought of it but the Harley guys are always talking about oils etc. The ATVs guys are usually just talking about how fast and far they went! With bikes the most common issue I see is tire pressure, a lot of the time I pick it out just looking at the bike parked. I ask the owner how it handles and they say great!! Dude your down 10 PSI, it handles like a piece of crap. The next big item is brake fluid, as the fluid absorbs water and breaks down you loose power and feel at the lever. It�s also bad for all your internal components, when you change your brake pads your Calipers should come apart to clean your pistons and put in new seals. Replace all the fluid and you will have like new brake performance. Believe it or not there are riders who won�t lube their chains because the lube gets their bikes dirty, not even sure what to say about that. Cables should be lubed every couple of years, easy to do with a cheap adapter and some lube out of a aerosol can. Levers should be removed and lubed, something most people have no clue about. 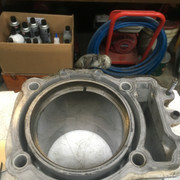 So as you can see it�s just not the oil and filter changes that make your bike well maintained it�s a lot of things that are exposed to the elements and wear and tear. I can usually find a bunch of items on any 3 year old bike or older that should see maintenance and not just oil changes. I hope this gives guys and gals something to think about and with goggle helping you help your motorcycle stay like new. During my brief stint as a mechanic we had a customer bring in a work van that would not start. We did the usual eval and found the oil to be .... grease. He said he kept the level up by adding and changed it every ten thousand miles - I think he meant never. I pulled the pan and it was full of .... petroleum jello. I stood it on end and after half an hour the "oil" abrubtly fell out as one solid lump. in fairness, there has been a definate trend towards "no user adjustable parts inside" in a lot of things. Cars w/o dipsticks, engine bits hidden under plastic cowlings that only come off with proprietary drivers, the by-and-toss electronics etc. 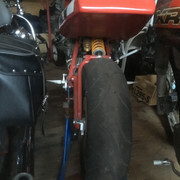 Most bikes have not gotten that bad but if you've ever had to peal the plastic off a fully flaired bike to get at something basic like a battery (certain Beemers use to bury them in very odd & hard to get at locations) you get the impression they were not exactly encouraging home mechanics. 'Not sure if that is causal or a reaction to but it's real. If you grew up on a farm you pretty much had to know how to fix everything because there was nobody to call. Now most people surrender manual competency on most things as they haven't a clue how things work or go together. This of course makes you more dependent upon others which always struck me as the antithesis of what motorcycles were about, maybe why the trend has been slower to get there. On a trip through Eastern Kentucky, we stopped an old courthouse to take pictures, and Kentucky State Trooper dropped by, interested in our bike. We got to talking about our trip, and about the area there, how much it was like our home with more mountains. I said something like "It's a real mix of really nice farms, along with trailer parks along a creek ..." and he said "Yup, it's amazing how many falling-down shacks and rusty trailers you see with a new Rhino parked outside it". And we DID notice that. Most of the nice UTVs were parked outside a place with tires on the roof and the dirt yards full of junk .... If they're wealthy, they're pretty eccentric, I'll say that! Watch out though, when you say that you're liable to get whacked with "Well I guess you'd like a manual oil pump and a leather belt drive and have to load your acetylene lamp with carbide pellets, wouldn't you .... ?" Very many people are swimming in the "you don't need manual competency if it's not mean to be worked on" kool-aid. 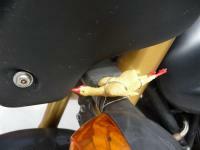 Although most people who enjoy our "character-filled" motorcycles aren't like that ... ! I was working as a heavy duty mechanic in the 70’s and I had removed the rad to get at the water pump. I ordered it and it was to be here the next day. I parked it outside the shop to make room and later on we got a call saying that the dump truck overheated. Looked outside and saw that the dump truck was gone. The operators had checklists to fill out before anything was to be started and do a walk around. 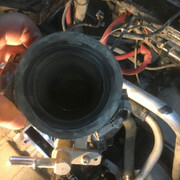 Have any of you noticed, older cars /trucks used to have grease fittings everywhere, but cars these days have none or very few. 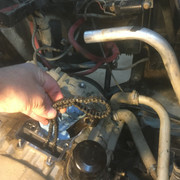 When I was a youngster working in a service station pumping gas, and doing oil changes/lube,the owner would test our knowledge by having us find and grease all the fittings on an old military Jeep. We usually would miss a couple......I think they had something like 25 fittings to grease, or more. Is this a sign of the times, where things are "throw away" , or are components actually built better where the can live their entire life with sealed lubrication? I was at the Harley museum a couple of years ago and counted that many grease fittings (26) -- either zircs or cups -- on just their girder and leading link front ends. I'd have to revisit my pictures to count the total number on a bike. Maintenance was a constant, ongoing thing before greases and seals evolved. Even simple things like chains have gone from rapid wear/constant oiling to o-ringed, maintenance free. Oil was a total loss proposition. Spark plugs were rebuildable. Spark advance was by hand. Hydraulic brakes, both automotive and m/c are a relatively new technology. Times have changed, and not all the changes are bad.